A new bombshell report based on a secret trove of seized Iranian nuclear documents shows the Islamic Republic had concrete plans to manufacture and build at least five nuclear weapons and that it was much further along in this scheme than previously known by the international community. Iran's contested nuclear weapons program was much further along than the international community thought, according to a report based on scores of secret Iranian plans seized by Israel and publicly disclosed for the first time earlier this year. Information obtained in this raid on Iran's secretive nuclear files has revealed that Tehran was well along the path to building several nuclear weapons by around 2003, including the complex infrastructure needed to produce such weapons, according to a new report from the Foundation for Defense of Democracies and Institute for Science and International Security, a nuclear watchdog group that has exposed in the past the extent of Iran's nuclear works. The report is being viewed as a bombshell revelation on Capitol Hill and is seen as validating critics of the Obama administration who alleged the former White House has underestimated the extent of Iran's nuclear weapons progress. "Iran intended to build five nuclear warheads, each with an explosive yield of 10 kilotons and able to be delivered by ballistic missile," the group disclosed in a new report that shows Iran has retained much of its nuclear infrastructure and could continue using it to clandestinely conduct weapons work in violation of the landmark nuclear accord. "Iran's initial plans show that it had achieved much more than feasibility and scientific studies relating to nuclear weapons, as the IAEA assessed in late 2015, as the Iran nuclear deal was being implemented," according to the group, which based its report on access it was granted to the seized Iranian nuclear documents, which show the regime allocated millions of dollars to the purchase of nuclear materials, including uranium, the key component in a bomb. "Iran had put in place by the end of 2003 the infrastructure for a comprehensive nuclear weapons program," according to the report. "The evidence supports that Iran was preparing to conduct an underground test of a nuclear weapon, if necessary. The end goal was to have tested, deliverable nuclear weapons, and Iran made more progress toward that goal than known before the seizure of the archives." Iran hawks on Capitol Hill say the report confirms warnings from many that the Obama administration downplayed Iran's nuclear activities in a bid to ink the nuclear pact with Iran. "Republicans have long known that the Obama administration lied to the country about the Iran deal," said one senior Republican congressional official familiar with the report. "Just a few months ago PSI published documents showing they lied to Congress about enforcing sanctions and giving dollar access." The latest disclosures are fueling the push in Congress for the Trump administration to reimpose greater economic sanctions on Iran, a portion of which went back into effect earlier this month. Some in Congress have called on the Trump administration to go further in its actions, including by fully cutting off Iran's oil exports and access to international financial markets. "Now this report shows they also lied about Iran's nuclear weapons work," the source said. "You can expect congressional Republicans to increase pressure on the Trump administration to implement maximum pressure on Iran, which they still aren't doing." Iran was poised to construct at least five nuclear warheads based on its weapons work at the time, according to the new report, which also found that Tehran's nuclear infrastructure was far more sophisticated than previously believed. "Iran made far more progress toward its goal of manufacturing five nuclear weapons than known before the seizure of the archives," according to the watchdog group. 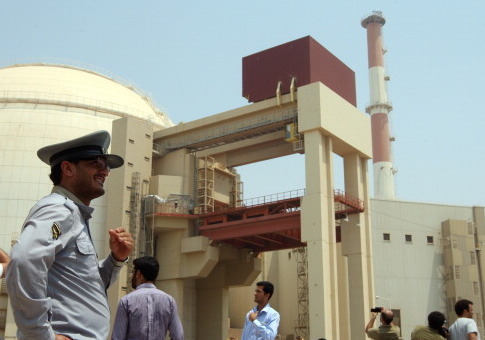 Information about Iran's nuclear activities, although far less complete, was kept hidden from the public as the Obama administration pressed the international community to support the nuclear agreement. "It must be acknowledged that at that time, the IAEA and the JCPOA parties, appeared to be downplaying the Iranian nuclear weapons program so as not to stand in the way of starting the implementation of the JCPOA in January 2016," the report found, noting that international nuclear inspectors have yet to take a stance on the new information. "Today, the IAEA has in its possession much of the content from the Iranian archive; it should be expected to act on this information, something that is not yet visible, after six months of examining the new information. This nuclear infrastructure remains intact, further fueling concerns about what Iran has been hiding from nuclear inspectors, who must give Iran advance notice of any inspections and refrain from entering the country's contested military sites. "The continued existence of the Iranian nuclear archive and warehouse reinforces that the Iranian nuclear program's remains, and likely some activities, may have continued up to today," the group said.